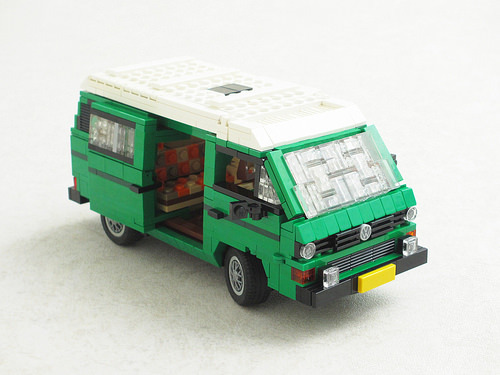 Back in 2011, LEGO introduced the 10220 Volkswagen T1 Camper Van to its line of Creator vehicles (followed more recently by the lovely 10252 Volkswagen Beetle). Both these official sets are at a larger scale than LEGO’s own Miniland scale, which is the scale that TBB’s own Ralph Savelsberg frequently builds his cars and trucks in. Ralph’s latest vehicle is VW’s T3 Westfalia camper van, complete with a pop-up top for extra head room when you head inside after a long day of drinking cold beverages from a cooler while sitting in your lawn chair. 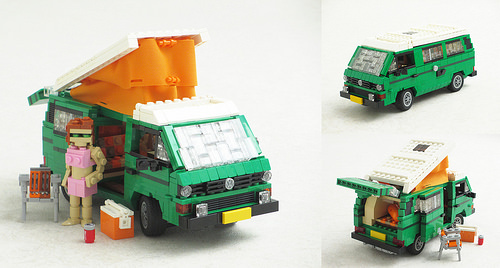 Ralph makes extensive use of hinged connections and 1×1 “cheese” slopes attached sideways to achieve subtle angles throughout the model, from the section below the windscreen to the shape of the van’s body underneath the sliding door. Naturally, the interior upholstery is a lovely checked pattern of orange and tan. I want one! I have the exact same real life model, as in 1981, and same green! Thank you. There aren’t all that many vehicles for which this green is a suitable choice, but it seemed appropriate for this van and I am glad you like it.